Are you a clearance shopper? I am! I love a good bargain. My mom taught me this skill. She anxiously awaits the end of every sale season. I will not pay full price for anything. I will make myself settle for something 75% off whether it is what I'm looking for or not. I'm not stingy. (My mom reminds me all the time how much money I waste on eating out!) I simply enjoy the thrill of low-cost treasures at "end of season" sales. I will admit as I've gotten older I've tried to limit purchases during clearance sales. When my girls were young, I bought their clothes a season or two ahead because I could get three times as much for my money. Age does bring wisdom. I limit shopping now because I don't want a huge amount of mindless clutter for someone to have to auction off when I check out. Seriously, I think about it. Now, I never purchase anything until I'm ready for it and actually need it. Do we treat salvation the same way? I hear a lot of people say "I'll go to church when I'm ready." or "When I need Jesus, I'll go." As I was surfing department store websites this week for clearance sales, I pondered how many people wait to the very end of their life's season to accept Jesus. Our freedom cost him his life. Salvation isn't getting any cheaper. Christ bestows redemption freely. However, you can't and won't be stingy to accept it. Salvation will cost you your pride, anger, resentment, fearfulness and every other human imperfection I could name. You will have to give it all to Jesus. Godly peace is the still the best bargain around. Am I really getting the best deals waiting for end of season sales? 1. I'm not really getting what I want, I'm settling for what's available. 2. I could have been enjoying my purchases for a lot longer time. 3. I would cherish something that costs me more. These same truths apply to our salvation. 1. Jesus can help you get out of life what you really want instead of settling for what comes your way.He's not only a ticket out of hell but he's a provider of a better life now. I'm talking about things that matter most in life like love, family, fellowship, faith, etc. Let him guide your life with righteousness. 2. Accepting Jesus is the sweetest thing you'll ever do at any age. But, a rebirth early on in life allows you to enjoy him a lot longer here! 3. As the old saying goes, when you have "skin in the game" or you apply all of yourself to something, you cherish it, you care for it, you protect it with your life. Jesus has "skin in the game". He protects you and me with his life. Don't wait for the end of the season to get a better bargain. There isn't one. Don't wait until you're ready, come when Jesus calls. Don't play the waiting game too much. You may be penalized for delay of game, get setback 10 yards and the clock run out while you're trying to make a decision. Or worse. You could be that ugly sweater that never gets purchased! 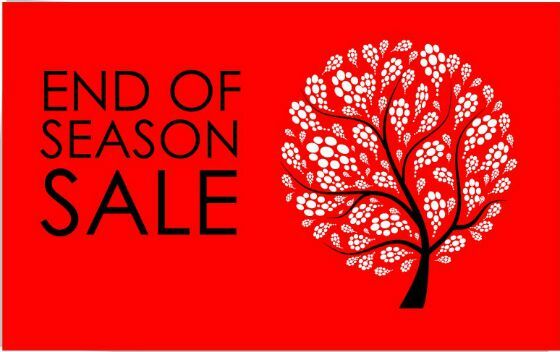 End of season sales are fabulous and Jesus does attend them but allow him to pick you off the rack now. He's already paid full price!